How to knit a hat. 1. 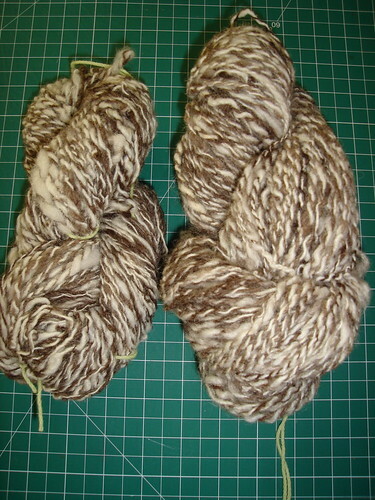 Take a skein of your very first handspun yarn and knit a tension (gauge) swatch. 2. Do some maths and cast on – ignore the vague sense of unease that it seems awfully wide by telling yourself that it has to go around the whole head. 3. Consult knitting bible to determine how long a hat for a man should be before you should start to decrease – ignore vague sense of unease that it seems awfully long by telling self that hats look different in three dimensions. 4. 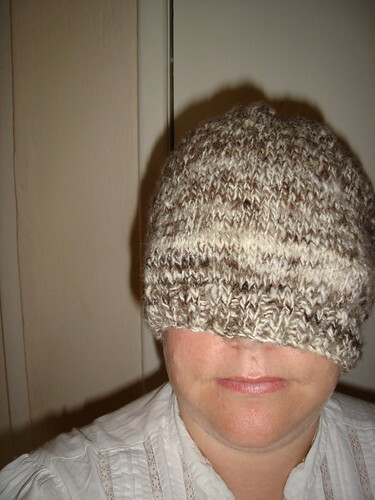 Ignore growing sense of unease and the remarks of a commenter that it looks awfully big for a hat by telling self that the seam will make a difference. 5. Finish decreases. Ignore the unease that is now screaming for your attention and sew up the hat. 6. Sigh, unpick stitching and frog hat. 7. Note with surprise that your yarn stands up to frogging. 8. Reknit hat ignoring previous gauge calculations. 9. Do the happy dance when the (second) hat fits the giftee. Remember to quickly snap a picture of the hat (it looks exactly the same as the one above, but smaller) before it walks out the door. Don’t you just have to laugh when your yarn argues with you? Even when flying on your face at half-mast, that hat is spectacular. [And yes, I can visualize the final version.] Well done! I love your handspun! Gorgeous in a hat no matter what size the hat turns out to be! In the end, you won and that’s what matters. Well done! And your hat is awesome! It looks fabulous! Well done, you should be VERY PROUD of yourself!